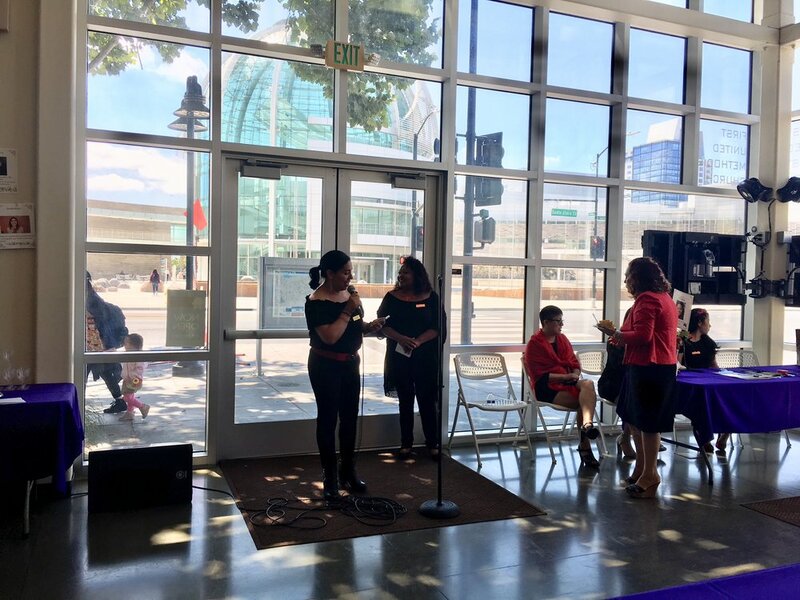 San Jose, CA--- Today META, a new co-op, officially launched and opened for business with a ceremony attended by dozens of partners, supporters, and friends. The event took place at the San Jose First United Methodist Church, with city hall acting as a beautiful backdrop as speakers touched on the significance of the event. The new co-operative is called META, an acronym for “Mujeres Empresarias Tomando Accion” (“Entrepreneurial Women Taking Action”). It is comprised of 17 women with diverse backgrounds and life experiences; they are all active community members in East San Jose and have gained leadership skills and training through SOMOS Mayfair, a local community-organizing group. META takes on contracts for community outreach, facilitation, and childcare for organizations in the South Bay. The women of META are all leaders in their neighborhood, sharing their time and expertise with organizations like Veggielution, Sacred Heart Community Services, and FIRST 5. They have a special relationship with SOMOS Mayfair, a non-profit that acted as an incubator for META, providing feedback and consulting services as the women made the decision to leverage their newfound skills as new business owners. “It feels amazing to make our own decisions about how many hours we work, how much we get paid, and how we operate as a business,” said Jacky Franco, another META co-owner. SOMOS Mayfair points to leadership development as their core strength--- they bring parents and neighbors together to identify individual talents and amplify community voice. All 17 co-owners of META went through SOMOS Mayfair’s leadership pipeline. “It’s so incredible to see these women creating economic opportunities for themselves. They are transforming their families and their communities,” said Camille Llanes-Fontailla, executive director or SOMOS Mayfair. “They’re breaking the stereotypes of what women can do and be--- in our community, women are often expected to stay home, and not to work. It’s amazing that they are building something bigger than themselves!” noted a community member in attendance.